Search.sp-cmf.com is a browser hijacker that is identical to countless others. They all exist for the same reason and that is to generate traffic for sponsored pages and in that way make income. Your browser’s settings will be changed and the hijacker will try to redirect you. If you are wondering how this hijacker managed to install onto your computer, you must have installed it yourself. 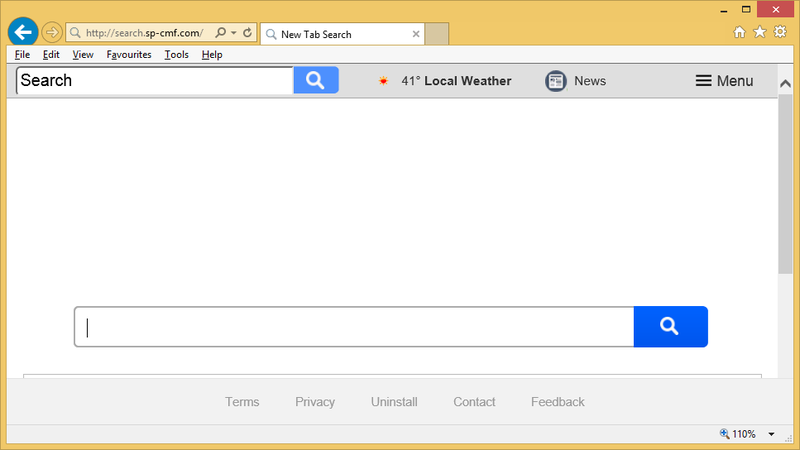 If you have recently installed free software, you may have missed Search.sp-cmf.com hijacker being attached to it. It is not malware so it will not harm your computer if you delete Search.sp-cmf.com right away. Otherwise, the hijacker may expose you to malicious content and you could end up with a serious malware infection. In order to avoid trouble, we recommend you uninstall Search.sp-cmf.com as soon as possible. Browser hijackers spread with the help of free software. Search.sp-cmf.com was probably attached to the last freeware you installed. It was set to install automatically and in order to stop it, you needed to deselect it. You can only perform that in Advanced (Custom) settings of freeware installation processes. All you had to do was uncheck the boxes of added items and that would have stopped them from installing. But because you rushed through the installation process in Default settings, now you are stuck having to remove Search.sp-cmf.com. When browser hijackers infect a computer, they usually take over all major browsers, be it Internet Explorer, Google Chrome or Mozilla Firefox. When talking about this hijacker in particular, your homepage and new tabs will be changed to Search.sp-cmf.com. This change will happen without your permission and you will not be able to undo the modifications unless you first uninstall Search.sp-cmf.com. Search.sp-cmf.com has a search bar in the middle of the screen and various game related links. If you use the provided search engine, you will be taken to Saferbrowser Yahoo where you may encounter sponsored results. We advise against clicking on any of the provided results as you could easily be taken to a malicious page where malware is lurking. Generally, browser hijackers merely aim to make pay-per-click revenue for sponsored pages by redirecting you to them. However, it does not ensure that all pages are safe and will not lead to a malware infection. If you do not want to endanger your computer, you need to remove Search.sp-cmf.com promptly. If you know where the hijacker is hiding, you can erase Search.sp-cmf.com manually and are welcome to use the provided instructions below this article. If you are having trouble, you can also obtain professional removal software and have it eliminate Search.sp-cmf.com for you. Automatic Search.sp-cmf.com removal would the quicker option as the program would find the hijacker for you.